World Bee Day has been officially recognised by the United Nations (UN), in a resolution to focus our attention on the importance of preserving honey bees and other pollinators and recognising the importance of bees for providing for the needs of humanity. The initiative was supported by all UN states, while 115 countries also acted as co-sponsors, including major countries such as the USA, Canada, China, Russia, India, Brazil, Argentina, Australia, and all EU Member States. The Official Opening of World Bee Day by Minister Mick Gentleman is at the Slovenian Embassy in O’Malley on Sunday May 20 at 10am. We are very excited about the launch of our ‘Love Food? Love Bees!’ Food Security & Sustainable Agriculture curriculum for high school created with Cool Australia . “Our food production is affecting the health of bees, but what can we do?” The six free online Year 9 & 10 geography lessons discuss threats to Australian food security and how to drive change. ted by Bunnings. Lots of fun for children with games and activities with a ‘bee focus.’ Bookings essential. The Parliament House of Australia chefs have been busy baking treats made with honey from their hives for the afternoon tea from 2.30pm. Bookings recommended. The Embassy of Switzerland in conjunction with the ANU Film Group will be screening the prize-winning documentary “More than Honey” by the Oscar-nominated Swiss filmmaker Markus Imhoof at 5pm at Coombs Theatre, ANU. The film will be followed by a short panel discussion on honeybee health issues and their potentially disastrous consequences. The event is free and no reservation is required. Details here. The WIN’S CREEK MEADERY at Murrumbateman is holding a delicious Beekeeper’s Breakfast 9:00 to 11:00 & a scrumptious Beekeeper’s Lunch from 11:00 to 4:00. Bookings essential. Akiba will be buzzy with hive crafted honey cocktails. The possibilities for pollinator inspired infusions to local cocktails are endless and more details will be revealed closer to the date. 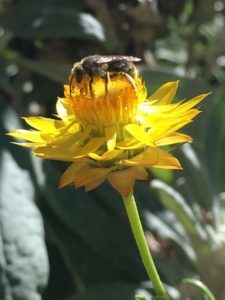 In recognition of the significant contribution bees make to the sustainability of our food system the Capital Region Farmers Market will be celebrating bees during the Saturday 19 May. Hold an afternoon tea for friends and ask each to bring a jar of honey so you can experience the amazing diversity of flavours of honey made from different flowers. Got any delicious cake recipes with honey? We would love to hear from you please! ps If you’re in the north of Scotland , Transition Town Forres is hosting an afternoon on bees followed by a “bee tea” and preceded by a refreshing of the wildflower meadow planted in 2016. That sounds like a lovely way to celebrate the bees. What will you do?